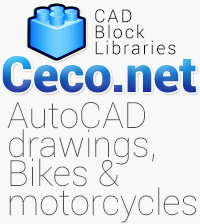 Description for this Autocad block : autocad drawing of a bicycle rear wheel, with bike cassette, a metal rim with aluminum spokes, stainless steel disc brake, and rubber rim. Rear mountain bike cassette on the wheel with chain. Block files in dwg and dxf format.